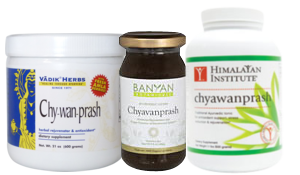 Among all the Rasayanas, Chyawanprash is most famous. It is the most popular rejuvenating Ayurvedic tonic in India. Chyawanprash has the consistency of jam and contains 20-80 herbs and spices, including the all important tropical gooseberry, Amla ( Emblica officinalis), the world's richest natural source of vitamin C. It works on the immune system by protecting the body against everyday infections that cause coughs, colds, and fevers. Suggested Use: 1 or 2 teaspoonfuls, twice a day. Can be taken on bread or crackers or with milk, juice, or other liquid. It can be used by children, old persons, tubercular patients, and debilitated persons.